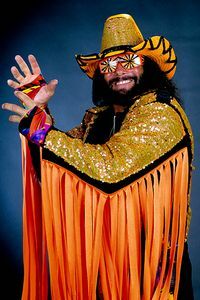 "Macho Man" Randy Savage was best known as one of the most famous professional wrestlers ever. Randall Poffo, Savage's given name, performed as Macho Man in the World Wrestling Federation, now known as WWE, during his heyday. His larger-than-life personality, trademark "Oooooh yeah!" catchphrase and attractive valet, Miss Elizabeth, made him a favorite of wrestling fans. He also enjoyed numerous endorsement opportunities, including his memorably campy "Snap into a Slim Jim" commercial series. But unbeknownst to many of his fans, Poffo, who died Friday in an auto accident in Florida, began his athletic career as a professional baseball player in the St. Louis Cardinals organization. He signed with the Cards as a catcher out of high school and later spent time in the Reds and White Sox organizations. Poffo played 289 games in four minor league seasons, batting .254 with 16 homers and 66 RBIs. WWE In addition to his wildly successful pro wrestling career, "Macho Man" Randy Savage played four seasons of minor league baseball. One of Poffo's teammates on the 1971 Gulf Coast League Cardinals, Larry Herndon, heard the news of Poffo's passing on the radio while driving on Friday. The two were roommates in St. Petersburg, Fla., that year, when both players were in their first professional season. Poffo was 18. Herndon was 17. "I have memories of him as a great teammate and a great man," Herndon told Page 2 by phone. "He was a pure-hearted individual. He really cared a lot about others." Poffo, of course, left baseball and followed in the footsteps of his father, Angelo Poffo, a pro wrestler. Herndon remained in baseball, reaching the majors in 1974 with the Cardinals and later spending six seasons with the Giants and seven with the Tigers. He won a World Series with Detroit in 1984 and coached with the Tigers after his playing career ended. Herndon remains in the Detroit organization as batting coach of the Class A Lakeland Flying Tigers. Herndon said Poffo was well-liked by teammates and described him as a diligent worker. "He kept everybody [on the team] loose," Herndon said. "He was always having fun." Herndon said Poffo used to swing a bat into a hanging car tire as a regular training exercise in order to strengthen his hands and make sure he utilized his legs during swings. The technique was so effective that Herndon adopted it from Poffo and still uses it with his Lakeland players to this day. Herndon said he and Poffo remained friends and spoke from time to time over the years, although they hadn't visited since the mid-1990s, when Herndon was a coach in Detroit and Poffo was performing there. Herndon took his son to see Poffo perform in a 1990 WWF event in San Jose, Calif., and said he and his son were in awe of the size and excitement of the event, with his former roommate playing the starring role. "He always had a big heart," Herndon said. "He was a man who really loved life and loved people."